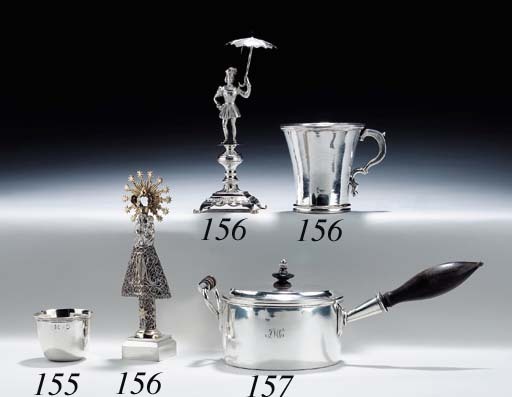 One of Canada's most important silversmiths, French-born Paul Lambert, dit Saint Paul (1691 or 1703-1749) arrived in Quebec City in 1728-29, as part of a group of artisans and naval officers recruited from Flanders. Lambert was a prolific craftsman, and the first silversmith in Canada to earn a living at the craft. His work includes important liturgical silver as well as civilian commissions. At his death, Lambert had standing orders for seventeen tumbler cups. These distinctively small cups were favored in Canada and were rarely made post 1800. Another tumbler in the Detroit Institute of Arts is illustrated in Ross Allan C. Fox's Quebec and Related Silver at the Detroit Institute of Arts, 1978, p. 97.